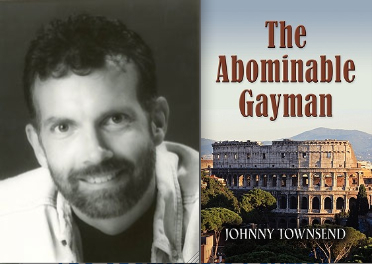 In the 10th in a series of posts on 2010 short story collections entered for The Story Prize, Johnny Townsend, author of The Abominable Gayman, offers an essay that explains the title and background of his self-published short story collection. “I could jump off this ferry into the Mediterranean, and everyone would think I slipped in the storm. Mom and Dad might be sad I’d died, but at least they’d never know the terrible truth about me.” Those were my thoughts as I left Sardinia and headed for the mainland of Italy back in February of 1981, shortly after I began my two-year mission to Italy. I spent those two years trying desperately to purge the homosexuality out of my soul by dedicating myself to God with all my heart. But there were problems. My mission leaders told me I could baptize 500 people a month if I had faith. Yet no missionary in our entire mission baptized more than a handful of converts during the whole time they were there. Were we all faithless sinners? Or were the leaders saying things that simply weren’t true? We went door to door telling people how happy they could be if they just became Mormon. And yet I knew from talking to the other missionaries that I wasn’t the only miserable person there. What was going on? These were supposed to be “the best two years” of our lives. And I found myself dreading church meetings and despising the rule to stop people on the street to ask them “the Golden Questions” so they’d invite us to their homes where we could indoctrinate them. And yet, in retrospect, while these were definitely not the happiest years of my life, they were in fact probably the “best.” They gave me an opportunity to think for myself rather than blindly continue following others. They let me see the world outside of Mormondom and outside of America. The dissonance I felt was unsettling, but I felt more alive than I ever had before. Then I fell in love, and the world changed for me forever. My Italian missionary companion would hold my hand, put his head on my shoulder, and kiss me goodnight. It turned out he was completely straight, but I learned that affection between men was a good thing. That revelation changed my life. Shortly after I returned to my hometown of New Orleans, I started taking writing workshops, and missionary stories began gushing out of me. I spent the next 28 years revising and refining them, while also writing dozens of other Mormon stories as well. I heard a good friend say in Priesthood meeting one Sunday, “I hope they don’t find a cure for AIDS until all the gays are dead.” After I came out, a friend called to tell me my presence had made her so uneasy at a church social that after I left, she had to call the bishop to come cast out the evil spirit I had brought. Church members told me over and over how they “hated the sin but loved the sinner,” but when good friends I’d known for years would see me and cross the chapel so they could avoid shaking my hand, I didn’t feel very loved. I was excommunicated from the LDS Church, and though I have many issues with the organization in addition to their harsh position against gays, I am forever grateful for those two years I served as a missionary. “The Abominable Gayman” tells the story of my journey from self-hatred to acceptance, and of the friendships made along the way, which endure to this day. Marisa Silver on Writing the Story "Pond"